Certain body parts are more important than others. Everybody knows that. On human beings, scientists are always tooting the thumb’s horn, and obviously the erogenous zones get a lot of attention. When it comes to animals, the focus tends to lie on the parts that are either the most delicious or the fluffiest. 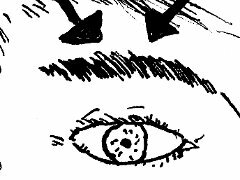 The part that no one ever talks about, but everyone seems to care about, is the lowly eyebrow. Humans, animals, robots? If it has a face, it better have eyebrows. And here’s why. First, let’s look at animals. 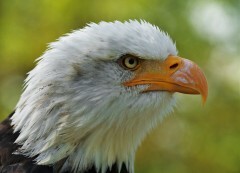 Here’s a picture of an eagle. It looks mean, doesn’t it. Practically scowling. And it looks that way all the time. It isn’t that bald eagles are particularly moody, though the heartbreak of hair loss can take its toll on even the best of us. They just look that way. As a matter of fact, check out virtually any large carnivore. They all look mean. I’ve got a pretty good feeling that WE only look that way when WE’RE trying to be scary because it makes us look like them. The human eyebrows are a handy dandy predator imitation device. Angry eyebrows are the visual shorthand for “something that wants to kill you”, and thus when you want to convey that message it is useful to look that way. Having a whole piece of anatomy just for making a frowny face isn’t very genetically efficient, though, so we started multitasking. If they work so well for anger, there’s no reason we shouldn’t be using them for other emotions as well. Before long, eyebrows and emotions were inseparable. If you have eyebrows, you have emotions. That’s why the dog is the most popular pet. It has some of the most expressive eyebrows in the animal kingdom, and that convinces us that they have all of the same feelings that we do. Cat’s are forever doomed to number two thanks to the worthless excuse for an eyebrow that they sport. And turtles? Forget about it. As one last little point, have you ever seen a person without eyebrows? It isn’t obvious at first. You can tell something is wrong, but you can’t tell what. The effect is profoundly disturbing when you finally realize. It is enough to put an actual, factual, living creature into the uncanny valley. That’s why Whoopie Goldberg didn’t need any makeup for her role as an alien on Star Trek: The Next Generation. And she won an Oscar! They should have given her two, because acting without eyebrows is like juggling with one hand behind your back. Pretty amazing for someone named after a cushion.